Standing behind the curtain with adrenaline pumping through our veins, emotion filling our brains as we walk onto the stage. This feeling is one we will cherish forever. The fans yelling, teammates smiling, music blaring and the excitement of competing at the United Spirit Association competition while representing Utah State University Eastern will remain in our minds until we are old and gray. Eastern’s dance and cheer teams traveled to Anaheim, California, on Feb. 22, to compete Saturday and Sunday against competitors from throughout the nation. During Saturday’s competition, the teams competed in a preliminary competition which each team had the opportunity to showcase a routine and place in a ranking system within their bracket. Eastern’s teams went through several practice times and check-ins with the USA staff. The practice area was intimidating with cheer and dance teams of all divisions building pyramids by the cheerleaders, males and females flying through the air, leaps, turns, tricks and tumbling passes in every spot in the ballroom. Music blasted to full capacity, coaches counting and yelling to ensure every routine is perfect. Teammates supporting one another while other teams watch to see if they rise or fall. After leaving the practice area and heading into the check-in room, each team performed its routine within nine minutes to make sure nothing in the routine(s) was illegal within USA’s guidelines. Eastern’s dance team had a quick change which made them have both of their check-ins within one-time frame, rushing to make sure both routines were safe to compete. Eastern took the floor in three categories: small co-ed show cheer two-year college, hip-hop two-year college and jazz two-year college. After the preliminaries, the Eagles were in first place for hip-hop, beating the competition by 10 points, third place for cheer following second place by five points and third place for jazz behind second place by one point. Striving for the back to back win in the hip-hop category, the Eagles were excited to have the announcement of holding the first place seed. Going into the finals on Sunday, Eastern prepared and went over corrections that the judges gave the night before. The process of the competition was the same as the night before and Eastern showed the judges that they could take their corrections and apply them to their routines. As each of the Eagles prepared to go on the floor, nerves, excitement and love flowed within each one because of the support that they have for one another. Cheer and dance stepped onto the floor while the other members of the Spirit Squad cheered each other on. After the last performances, the Eagles made their way onto the stage for awards. Eastern’s cheer category was called first; “fourth place to Utah State University Eastern”. Proud of their performance and the opportunity to represent Utah at the competition, the cheer team congratulated their competitors. Next up, two-year hip-hop. Looking for a back to back championship, the Eagles held onto one another as the announcer called out first place, “Utah State University Eastern”. 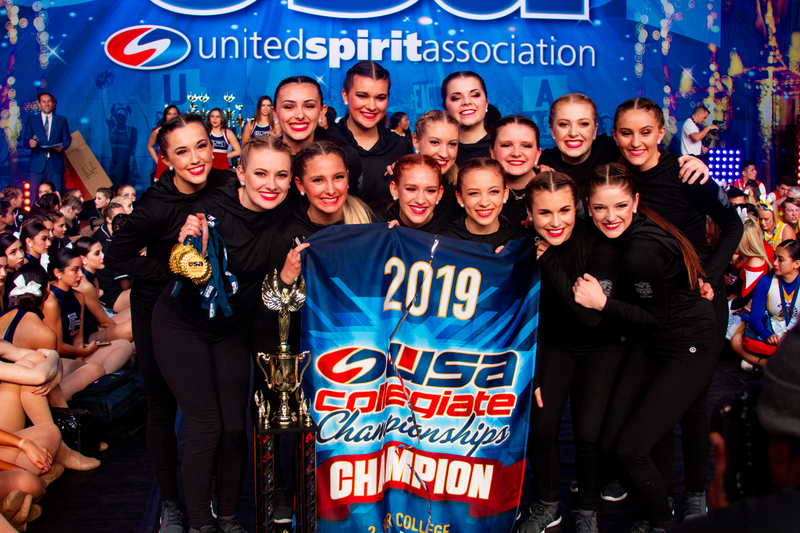 The Eagles jumped up with enthusiasm and excitement, going wild as they ran to center stage to get their award and a picture of the back to back hip-hop national champions. Filled with excitement and joy of the achievements of becoming back to back National Champions, Eastern was proud of doing what they set out to do, which was being named the title of back to back Champions. Finally the announcer announced the two-year Jazz category where the Eagles took third place. Even though it wasn’t first place, Eastern was thrilled with the opportunity to represent Utah and Eastern at USA competition. Happiness filled the convention center as the Eagles hugged and took pictures with loved ones, each other, medals, trophies and banners and they headed to the bus for the trip back to the hotel. Singing and dancing the entire way to the hotel, the Eagles are happy for what they achieved at the USA competition and supported one another from start to end. Bringing home a back to back championship, you can watch the Eagles at the Scenic West Athletic Conference Basketball tournament in Price, Utah this Thursday Feb. 28 through Saturday Feb. 30 and come to the dance team concert March 29-30 to see the back to back champions in concert.